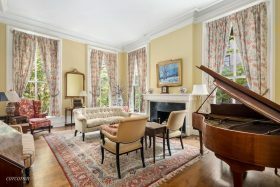 This townhouse-sized and undeniably grand parlor floor duplex at 196 Hicks Street (also known as 34 Pierrepont Street) in historic Brooklyn Heights is one of only three apartments within the “mansion annex” of the 200 Hicks Street cooperative. But unlike most townhouses, the 2,800-square-foot property steps from the Brooklyn Heights Promenade comes with around-the-clock doorman, plus secure storage and a gorgeous roof deck. The apartment does, however, have its own private stoop.